If patient is under 40 with an HLA-matched sibling available, a stem cell transplant is generally recommended. If patient is over 40 with no HLA-matched sibling available, immunosuppression with ATG and cyclosporin is the recommended treatment. If the patient is under 40 and has failed at least 2 courses of immunosuppressive treatment, an unrelated donor stem cell transplant should be done if a fully matched donor can be found. Note: It is important to monitor the blood counts closely for any sign of improvement while organising a stem cell transplant or immunosupression. Spontaneous recovery of bone marrow function may occur even in severely affected patients. The following image shows how to treat acquired severe aplastic anaemia. 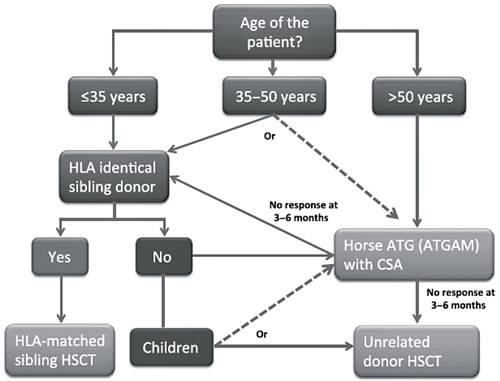 HSCT may be considered for patients aged 35-50 who fail to respond to first line immunosuppressive therapy. This requires a matched sibling donor or a suitably matched unrelated donor if no matched sibling donor is available. (Sureda et al 2015). ATG, antithymocyte globulin; HLA, human leucocyte antigen; HSCT, haemopiietic stem cell transplantation; CSA, ciclopsporin.